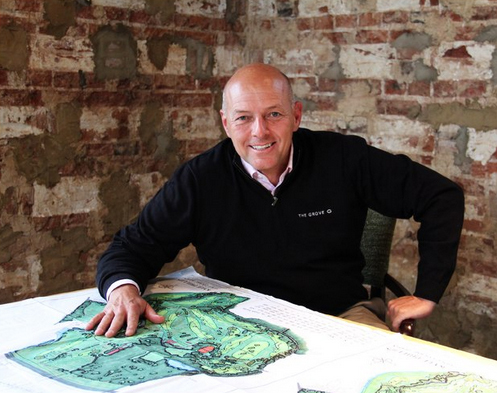 ALTHOUGH HIS OFFICE IS LOCATED in Granite Bay, California (a suburb of Sacramento), course architect Kyle Phillips has worked extensively around the world. His designs can be found in Austria, Sweden, South Korea, Scotland, and Morocco, among other countries. Troon Golf & Travel spoke with him in England, where he was visiting his 18-hole creation at The Grove in Hertfordshire. The Grove, your first English design, opened in 2003. What can you tell us about it? People who come to The Grove for the day never feel that they have been slighted. The condition of the golf course is always superb, as is the service from the moment people arrive to the moment they leave. For me, it was gratifying to work with the owners and it was a seamless transition when we handed the course over to the operations side of things. In this case, we have had a real consistency of ownership and philosophy, which is always a real benefit to how the final product is received. I have great memories of designing and building this course and it is great fun to carry on working with a lot of the same faces who were here when we opened over 10 years ago. You’ve said you replicated different types of landforms at The Grove to make it reminiscent of classic English courses. Explain. This was a classic English parkland site. When you look across the landscape here with the longer horizon lines and you walk through the holes, you start to recognize some interesting landforms, some more dramatic than others. These begin to affect how you think about strategy on a particular hole. So, at a macro scale, the course looks rather sympathetic, but at a micro scale, it really takes on an interesting personality. And part of creating this was remaining responsive to the integrity of the historic landscape that was around it and, at the same time, achieving a great golf experience. Do you think The Grove model, whereby a premier service and product is offered on the basis of pay and play, should be used more elsewhere? This model is really unique. As nongolfers, the owners come at it from a different angle and this tends to be where a lot of the good ideas come from; people who are not so deeply connected into golf that they don’t just see the forest but the individual trees. They saw a gap in the marketplace and appreciated the business side. Not having members allowed them to accommodate hotel guests and the corporate market whenever they want to play. Of course, if you have members, they want to play on a Saturday morning and at all of the prime tee times. The Grove model eliminates this conflict by creating a club experience in terms of quality and conditioning, but available to everyone. People have been talking about controlling equipment for a long time now. Do you think we’re any closer to this and, as an architect, do you think this would benefit the game? I would love to see some controls because I really believe the game should be more about shot-making. But you can read books that are 100 years old and you’ll see discussions about the ball and how far it was going and how equipment was affecting the game. Even in my short time, I remember Jack Nicklaus hitting it 267 yards from the tee and everyone was aghast at how long he was hitting it. You look at that today and that kind of driving distance is laughable, but that’s simply due to the benefits of technology. As an architect, I have my own views, but my job is to respond to technology on the design side. I have seen an increase in what is considered to be a championship course from the back tees, but people playing from the forward tees expect the same length course as we had 30 years ago. This makes it more difficult to create a course that is playable and enjoyable for the full spectrum of abilities. But this is something that we, as architects, have got to rise to and get better at in order to respond to trends. Can you, as a golf course architect, do anything to counter slow play? I think there are things we could do. There is an issue with people trying to learn the game who go to championship- level courses without the required experience. I equate it to skiing. If you take someone who has never skied and send them down a black diamond run, it won’t take long to realize they are not going to be successful. They need the bunny slopes, as do we in golf. We need shorter courses. Can golf architecture help to enhance player retention? Every time there is a shift in the economy, people feel like they need to be at work more, so the drop in golfers is just a natural result of the economy, as much as anything else. As the economy stabilizes, people are coming back to playing golf. Nowadays there is also so much distraction from other sports, and there is also the whole world of technology that people can live in and not think about playing sport. Time is precious, so we have to ask, what can golf do to attract people to the game? We have looked inside the industry for those solutions; we’ve heard a lot discussed about shorter courses and par-3 courses within existing golf operations, for example. However, I tend to think that the solution may come from the outside with a different form of golf that becomes the gateway. We are seeing that with screen golf and video golf in some of the Asian countries and in the UK, and those are ways for people to spend a couple of hours with a golf club in their hands and perhaps get excited about golf, and we need that.